Observation - Verdigris Agaric - UK and Ireland. Description: Blue/green fungi. Slimy,cap approx 2cm. 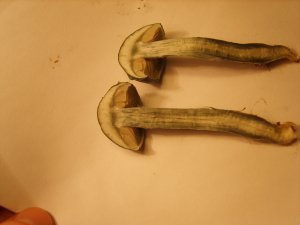 Gills pale fawn, stem light blue/green. Found in deer parkland in rough grass. Blue/green fungi. Slimy,cap approx 2cm. Gills pale fawn, stem light blue/green. Found in deer parkland in rough grass.